And for a time, those systems were more than sufficient for the intended applications. As emerging technologies made smaller drop sizes a reality, it became more difficult to maintain production speeds, much less increase them. With drop sizes decreasing in picoliters from more than 80 to 50, then 30, and eventually to 10 and less, image quality was on the rise. The tradeoff, however, was production speed. The answer was to add more printheads or - more specifically - nozzles. Since printheads are the most expensive components on any print system, this forced manufacturers and end users to choose between improved image quality and high production speeds. In fact, some manufacturers offered platforms that were intended to meet the needs of one or the other. This was done by offering a single platform that allowed users to choose printheads with either small or larger drops. Most developers realized that grayscale-capable printheads could be the next step. The transitional technology between binary and grayscale is now referred to as variable-drop binary. While capable of only one drop size at any given time, the printhead could be adjusted to fire additional sizes. That could be accomplished by merging multiple drops either in flight or at the substrate. It allowed the user to have more control of the quality level of each print. Users could choose smaller drops for critical work and choose large drops for less critical work or work that would be viewed at a distance. Of course, each choice came with a downside. Smaller drops meant slower production speeds and larger drops meant lower image quality. All things considered, the goal is simple: Get as close to continuous tone or photographic quality as possible at the fastest acceptable production rate. The use of variable-drop printheads served as a good transitional phase between the days of single-size drops and the imaging systems available today. Except for some small-format systems that generally ran very slowly but yielded high image quality, true high-quality grayscale remained just out of reach. Each nozzle of a binary printhead uses same-size drops to fill the matrix for any given image area. (See Figure 1.) Combined with sophisticated screening and drop placement algorithms, binary served its purpose well. However, as the race to higher and higher image quality escalated, binary's limitations became apparent. Highlight and quartertone areas often displayed some level of grain (peppering). This was best demonstrated in the white area of an eye, transition or highlight. To increase apparent resolution, many manufacturers added more color channels. 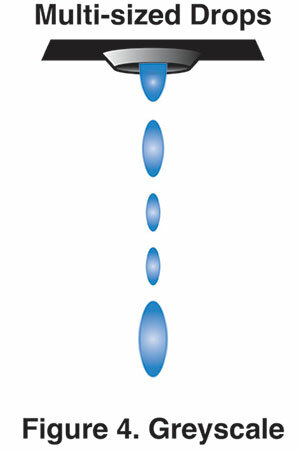 Typically, a light version of cyan and magenta was used to help disguise the white space between the drops made of CMYK. It worked by placing lighter, slightly more transparent dots in median areas to create smoother transitions between the primary dots and to convince the eye to perceive higher resolution. (See Figure 2.) This was a very successful way to increase image quality, but it was detrimental to overall ink usage and cost. At some point, binary drop sizes became small enough to reduce the appearance of grain, but the process required more printhead passes, more nozzles or both to meet ever-increasing production requirements. Every image segment must meet a specific density threshold in order to achieve satisfactory image quality, and this is especially critical in solid color areas. 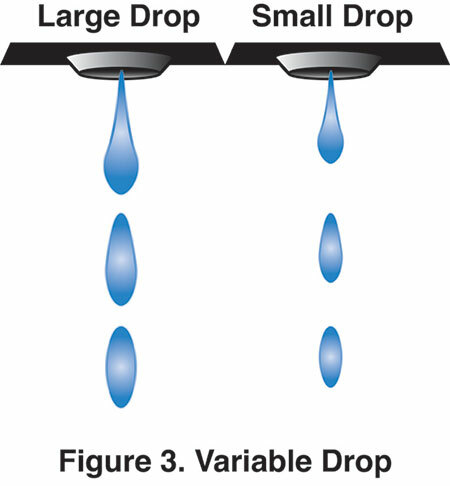 Variable-Drop Binary Variable-drop binary is a binary printhead with the capability to deliver different-size drops -but it's limited to one size at a time. The idea was to give the printer the capability of delivering both high image quality and high production speed in one system. 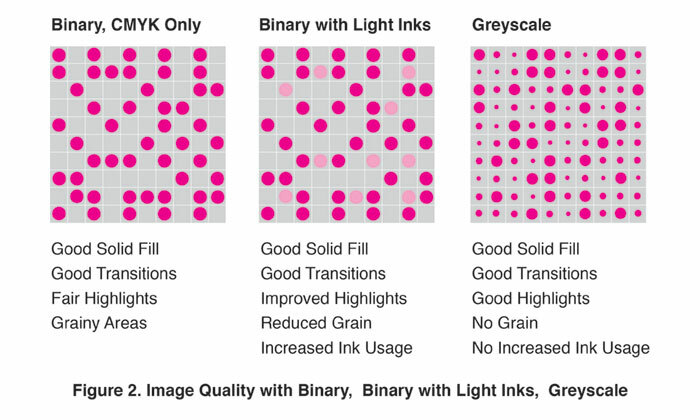 Grayscale Grayscale printheads overcome the limitations of binary printing at smaller drop sizes while offering the benefits of variable-drop printheads in a dynamic format. 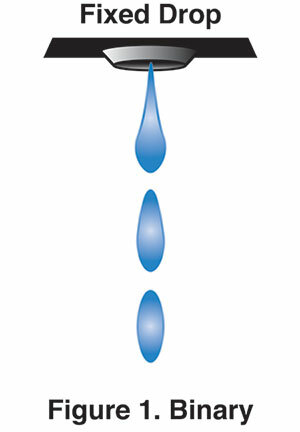 Grayscale printheads are capable of firing a range of pre-defined drop sizes from the same nozzle within the same image area, either by combining drops at the nozzle or in flight. A printhead that can expel four or more drop sizes - 0, small, medium and large - has the capability to fill a specific tonal area while remaining clear and sharp. Grayscale printheads generally have a lower native resolution than their binary counterparts. However, grayscale heads can obtain the same apparent resolution at faster speeds as binary heads with higher native resolution. The real benefit of grayscale-jetting is that it's possible to meet the high frequency required to fire all the drop sizes at once. It's not necessary to reduce speed in order to fire the smallest drops. Grayscale allows the system to print a high-resolution image with increased sharpness and tonality at high production rates. A remote but possible downside to grayscale is that the finer dots may be sensitive to turbulence and windage by high-speed carriage travel. The effect would appear as slightly misplaced or offset dots. Most grayscale systems are designed to eliminate this possibility. An additional benefit of grayscale is the reduction of ink consumption. The use of light versions of cyan and magenta inks increased consumption from 18% to 25%, depending on the system being used. In most cases where light-color inks are employed, they are used first at 100% levels. Then the full- strength cyan and magenta are used in small amounts to get to the final color and density required. By removing the lights and using only the regular CMYK inks, however, usage can be cut significantly. The capabilities of today's true grayscale printheads are far beyond what first-generation developers of digital print technology hoped for. 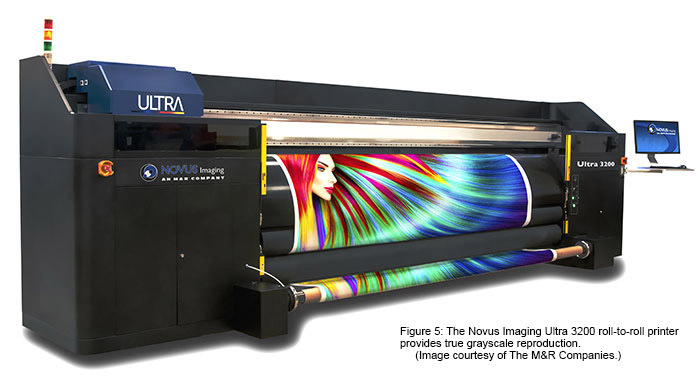 They deliver higher image quality than the industry requires without sacrificing the production speeds necessary to meet current high-production printing. And as the industry continues to refine grayscale printing, inkjet printing comes ever closer to true photo-realism. This article appeared in the SGIA Journal, May / June 2018 Issue and is reprinted with permission. Copyright 2018 Specialty Graphic Imaging Association (www.sgia.org). All Rights Reserved.